I know Amy JUST posted a baked eggs recipe but I couldn’t resist doing this one… I saw this skillet baked eggs recipe in the January issue of Bon Appetit and my mouth has been watering ever since. This could be served for breakfast, lunch, dinner, or even a mid-afternoon snack. You also can’t beat the skillet-served presentation. In a small bowl, mix the yogurt, garlic and a pinch of salt together and set aside. This seemed really odd to me at the time, but it turned out well! In a large pan over medium heat, melt 1tbsp butter with 1 tbsp oil. Add the scallion and leek, reduce to medium/low and cook until they are soft — about 10 minutes. Add the spinach and lemon juice, season with salt, increase the heat and cook until the spinach is wilted — about 5 minutes. At this point, you can choose to use 1 10″ ovenproof skillet, or 2 6″ ovenproof skillets to serve in. Transfer the spinach mixture to whichever skillet situation you decide on. 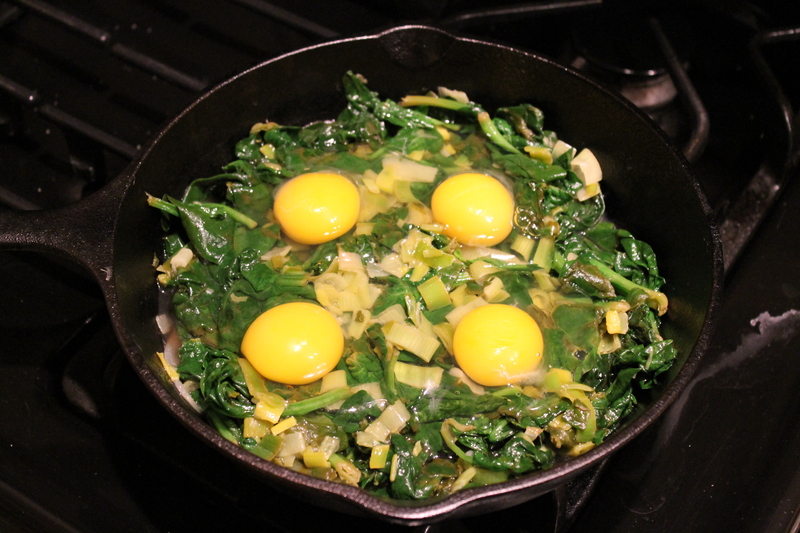 Make either 2 or 4 indentations (2 for the smaller skillets, 4 for the larger) in the spinach mixture, and crack eggs into each — be sure to not break the yolk! Bake them until the eggs are set — I used a larger skillet and it took me about 20 minutes, if you are using the smaller ones you should probably check after 10. When the eggs have just a few minutes left, melt 1 tbsp butter in a small pan. Add the crushed red pepper/paprika OR kirmizi biber and cook for about 1-2 minutes, until the butter begins to foam a bit. Add the oregano and cook for another 30 seconds. 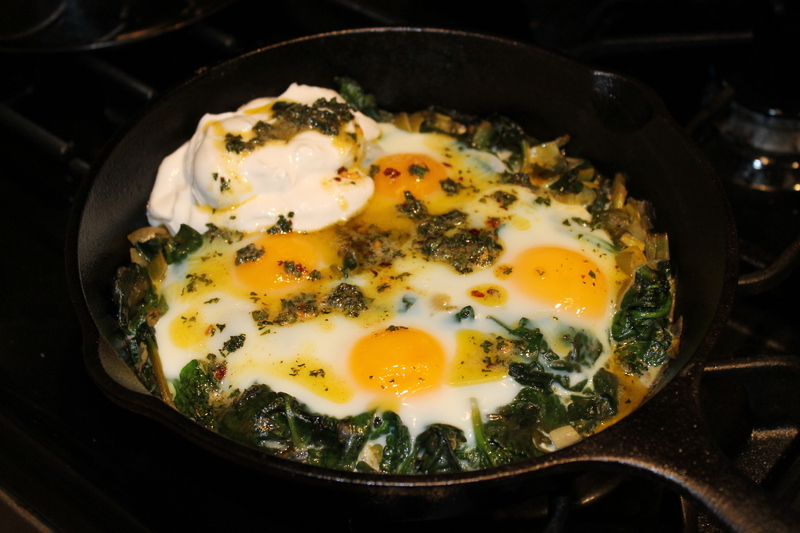 When the eggs come out of the oven, remove the clove of garlic from the yogurt mixture and spoon over the eggs. Drizzle the spiced butter on top and serve! Hoooo boy is this good! This entry was posted in Spinach and tagged breakfast, dinner, eggs, garlic, leeks, lunch, oregano, scallions, spinach, yogurt. Bookmark the permalink.